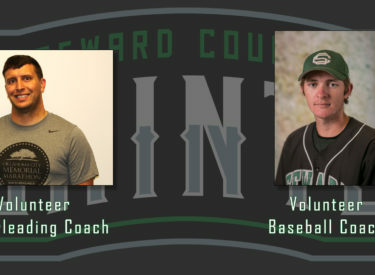 LIBERAL, Kan. – The Seward athletic department announced Thursday, the addition of two volunteer coaches to their coaching staffs. Austin King will be assisting with the baseball team, while Tate Cain will be helping the cheerleading squad. King comes to Seward after working at 5 Tool Baseball in Amarillo in 2017, where he was the head trainer for the throwing and hitting program called Top Gun. King played at Seward County for two years in 2013 and 2014. In 2014 he was named to the Capital One Academic 1st team All-District team. King had a strikeout to walk ratio of 77 to 4 in 2014 and didn’t issue the first walk until the 45th inning of the year. After Seward, King went on to play at Western Kentucky University in Conference-USA. King earned two associate degrees at Seward and his bachelor degree in Business at Western Kentucky. Cain joins Coach Carisa Owen on the cheerleading squad. Cain went to high school in Tyrone, Oklahoma where he competed in different sports. Upon graduating from Tyrone, Cain attended Seward County for three years where he was a member of the spirt squad for two seasons. Cain was also a member of the athletic training program for all three years.